Regular exercise is encouraged with the Gorilla Playsets Great Skye II Treehouse Swing Set with Amber Posts. The swing belts makes them pump their legs and get their body moving. This premium cedar wood playset is pre-cut, pre-sanded, pre-stained and ready to assemble in your backyard over the weekend. The play deck is protected with a tongue and groove wood roof and includes an upper-level treehouse with working shutters. The entire playset is finished in a beautiful amber stain. 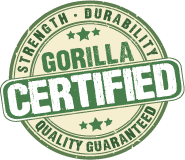 Gorilla Playsets cedar naturally resists rot decay and insect damage.